What we learned is fascinating. Like: People in India are more likely to own a smart appliance, whereas people in Argentina are more likely to own a smart TV. And: People everywhere are worried that a more connected future will jeopardize their privacy. Below, read 10 fascinating things we learned. In the coming months, Mozilla will use these findings to help guide our advocacy and public education work around internet health. The more tech savvy people are, the more optimistic they feel about a connected future. 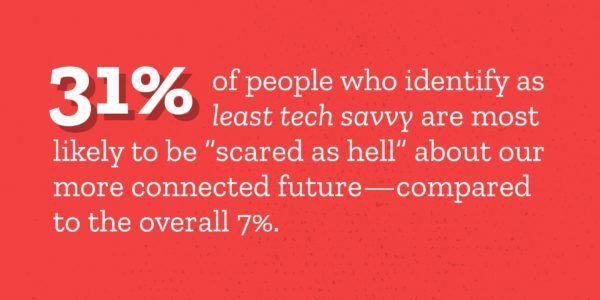 People who identified as the least tech savvy are most likely to be “scared as hell” about our more connected future—31% compared to the overall average of just 7%. 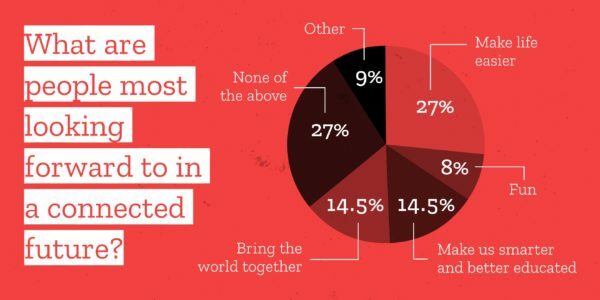 Respondents in India were the most optimistic about the connected future, with 25% being “super excited,” compared to the overall average of 7%. Mexico and Brazil also stood out as generally more optimistic countries. On the other hand, people in Belgium, France, the UK, Switzerland, and the U.S. expressed fear about the world becoming more connected. When asked what they most fear about a more connected future, people overwhelmingly responded with loss of privacy (45%). All top responding countries pointed to the loss of privacy as their main concern, with the exception of Italy, which saw loss of connections with other people as their main concern. The more tech savvy a respondent was, the more he or she was concerned about the loss of privacy. 33% of the least tech savvy group identified loss of privacy as their top concern—the number rose to 41% for average users, 48% for the savvy users, and 54% for the ultra tech savvy. Conversely, losing touch with one another was the highest concern for the least tech savvy respondents. Fewer than 30% of respondents said they could explain IoT (Internet of Things), botnets, blockchain, RFID, or Zero Day Vulnerability to a friend. Fewer than 40% of respondents said they could explain DDOS attacks or TOR. 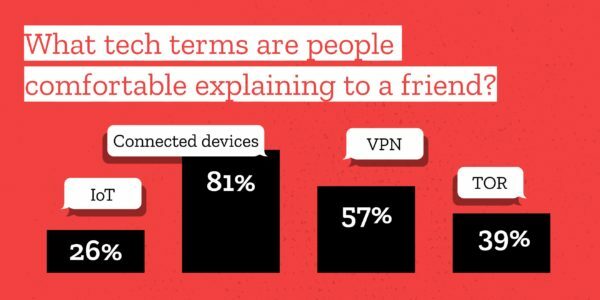 The only two things more than half of the respondents said they could explain to a friend were VPN (Virtual Private Network) and connected devices. 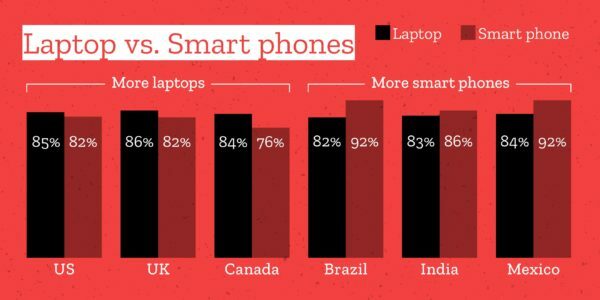 In the United States, Canada, and the United Kingdom, more users reported owning a laptop than a smartphone. In most countries outside of North America and the UK—including Brazil, India, Argentina, Mexico, Italy, and Spain—more people reported owning a smartphone than a laptop. People who identified as the least technically savvy were more likely to own a laptop than a smartphone. Respondents from Argentina, Brazil, and Mexico own smart TVs at the highest rate—50% reported owning one compared to the worldwide average of 40%. 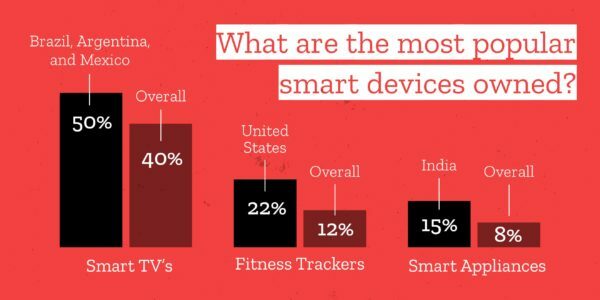 U.S. respondents reported the highest ownership of fitness trackers (20%), smart cars (15%), and connected thermostats (8%). Respondents from India and Brazil reported the highest ownership of smart appliances—15% compared to the worldwide average of 7%. 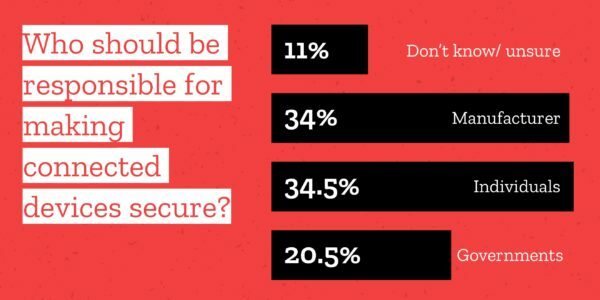 One-third of respondents believe the makers of connected products are responsible for building privacy and security into their devices. 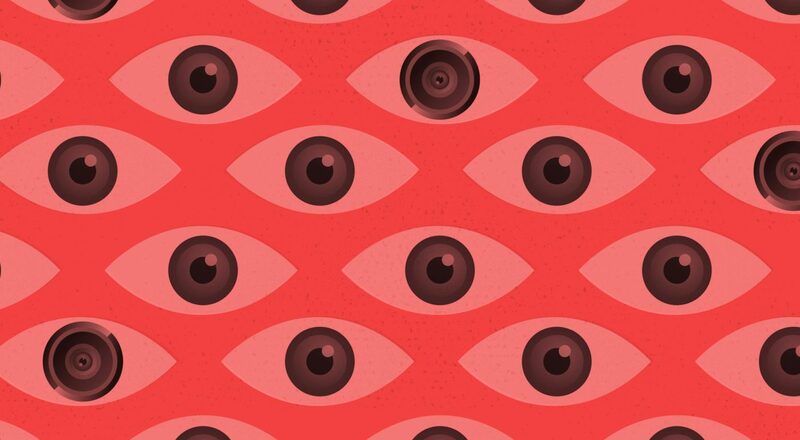 One-third believe it’s up to individuals to protect themselves online. The remaining third of respondents were divided between believing the government was responsible for online privacy and security and just not knowing who should be responsible. Most respondents—40%—trust non-profit organizations the most to help them protect themselves online. The more technically savvy that people viewed themselves, the more they trusted nonprofits. On the flip side, 27% of people reported they just don’t know who to trust. That number jumps to 45% among people who identified as the least technically savvy. 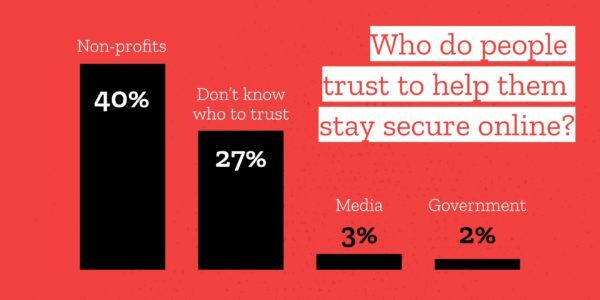 Almost nobody said they trusted the media (3%) or the government (2%) to help protect them online. The top response to the question “What are you most excited about as we move toward a more digitally connected future?” was None of the Above (27%). People in Canada, France, the UK, and U.S. saw the least amount of benefits to a more connected future. People who are excited about a connected future are looking forward to how much easier it will make life (26.7%). Brazilian respondents stood out as the most excited about how easy life will be—44% selected it as the top benefit. In India, educational benefits of the connected future were what got respondents most excited (32%). 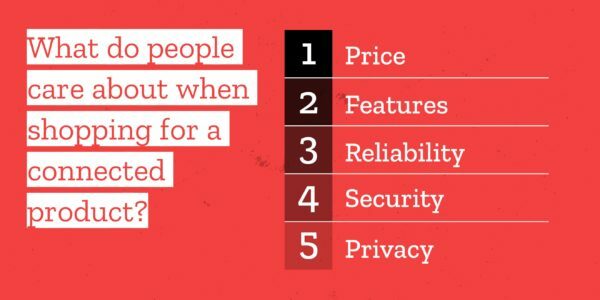 Nearly all people ranked price, features, and reliability as the top three things they consider when buying a new connected device, regardless of country or level of tech savviness. Security and privacy were ranked next. Overall, people reported friend or family recommendations and user reviews as the things they considered least when buying a new connected device. 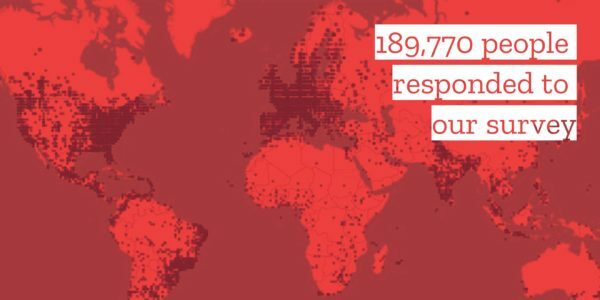 189,770 people responded to our survey. People from Andorra to Zambia and everywhere in between. The most responses came from France (18%), Italy (15%), Germany (13%), the United States (11%), and Brazil (7%). 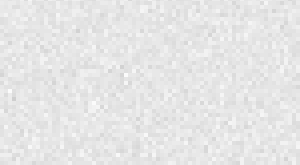 Mozilla is making this data available under a CC BY 4.0 license.